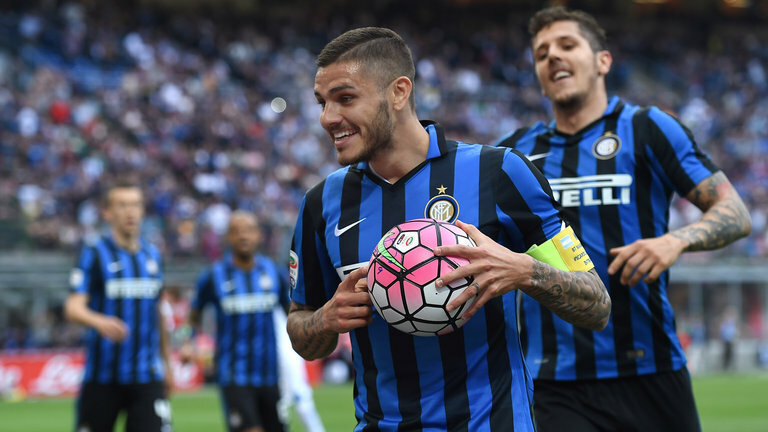 Tottenham and Arsenal are interested in signing Mauro Icardi, says the Argentine striker's wife and agent Wanda Nara. The Inter Milan striker and club captain has reportedly drawn interest from clubs across Europe, and is said to be going through a dispute with the club over a new contract. And Nara has spoken publicly about the availability of her husband and client, saying the 23-year-old must receive an improved contract at the Serie A outfit if he is stay on for the 2016/17 season. "We want to stay in Milan. People say I am a mercenary, but I am not," she told Italian newspaper Corriere della Sera. "[Inter] have to say the truth. They can't say Icardi is not for sale and then talk to other clubs. "I've asked for a renewal because the club had promised me a renewal. "Last year we accepted their conditions, which mean a lower salary, the sale of the 50 per cent of Mauro's economic rights and there is no release clause on his contract." And Nara says there are numerous clubs interested in his services, including the two North London rivals. He added: "[Inter] have to keep their promises. "There are many offers, but I do not negotiate with other clubs. I only talk about Mauro's contract, that's my role, not doing negotiations. "Atletico Madrid, Tottenham and Arsenal have made contact. Napoli and Roma are also interested now." After moving to I Nerazzurri for the 2013/14 season, Icardi has scored 52 goals in 105 appearances in all competittion.